so a tracker if you put them on animals. Yeah, I proposed this in my fourth bunch of ideas. Or a beacon that doesn't drift away. Can you use beacons inside? Yes, you can. It will hover above the floor. So... this game is amazing, I played it for like a month non stop, reached "end game" and since It's EA, I just moved to other games while the DEVs do their thing. I know there is a Trello brad, Changelogs and etc. But, can someone consolidate info on what's up? What feature can we expect in the next update? When will it come? I'm scared, because ARK is updating non stop, Space Engineers will get planets soon, even Rust is getting better, I may loose my social life if Subnautica releases an awesome update too. yeah, actually it was me. it's the hive from natural selection 2 another game from unknown worlds! Yeah sorry 'bout that : I read that original message (on Steam, I think) and downloaded the image before I created my Unknown World Entertainment account, and didn't re-visit the page for at least three weeks, so I'd completely forgotten about it. I would like Rabitrays to be able to be put inside aquariums : I'm aware that the player can't pick rabbitrays up, but, judging from its size, it seems to be twice the size of a peeper/airsack/... So if the player can eventually pick it up and put it in the inventory and then in the aquarium, the animal should only take 2 or 4 spaces. I wouldn't want it to be edible though : to me it seems way too massive for a single meal, and eating one would feel like cheating. So please make it poisionous to the player or something. Often, players do more than one "mission" or exploratin at a time, and they tend to forget to do some of them. It'd therefore be really cool to incorperate a sort of notepad onto which the player could type/write not only reminders, but also important or interesting observations made while playing. It's a sort of diary, I know. I've already mentionned this (other people have), and I will mention it again (other people may have) : THE CREATURES DESPRATELY NEED TO VARY IN SIZE/SHAPE/COLOUR ! WHEN ARE YOU ACTUALLY GOING TO FIX ALL THESE ANIMALS THAT ALL LOOK LIKE CLONES ?! Also when are we gonna get text to speech communication? I wanna yell Johm Madden at some fish. Noticed in the most recent update, that structures above water no longer have a structural integrity requirement. Sweet. Time to industrialize that entire island. Hope those plants aren't endangered or anything. Nope but I can guess by the time you've finished they will be. Why does the moonpool have four feet that look like it wants to stay on ground? I always place my moonpool somewhere underwater but high above ground, so I can dock with ease, if there wouldn't be those built-in feet blocking my path. 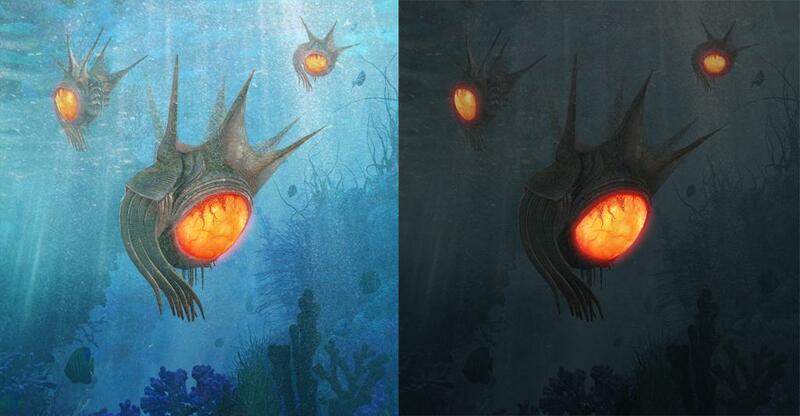 It would make sense for a bottom moonpool, but who'd really want to place the moonpool that close above the sea bottom? And a question about the nuclear plant. Why is it that small? And wouldn't we want to add some power emergencies with a nuclear blast for the worst? Wouldn't it be better to use a seperate structure with a powerline to connect a far away station from the distance? Third, will the cyclops get a solar regeneration module or an underwater base dock for recharging, repairing or construction? Finally the vertical shaft ladder is teleporting in zero time right now, even for distances like 200m. What would be better - a climbing animation of the body with climbing time or a lift animation of a cabin with the lift taking time and discharging of power? Forgot that I can see built structures from a greater distances than lets say a surface island. How long will it take to see the island first and the base station on it some time later? the vertical shaft ladder is teleporting in zero time right now, even for distances like 200m. That's actually the reason why I'd love to see a vertical turbolift. I have a few ideas for the Cyclops. If you devs don't mind reading a small wall of text send me a pm as it could give one of your guys something to do for a while (like when you were doing the Sea Moth upgrade). Also on the alteration note I was thinking that if you expand the moon pool by 50% it would let you dock 2 Sea Moths instead of 1 (have the mounting point set in the center on 1 side with a walkway in the center between the 2 docking points so the Sea Moths face the center). Then you can up the Sea Moth's upgrade slots to 6 and have 3 on each side. By keeping the current moon pool you can use it to dock a "Sea Ray" (so your time was not wasted). My idea for the Sea Ray is that it is just a slightly longer Sea Moth (add 50% to the total length). The biggest differences would be that it would have 2 power cells (instead of 1), 8 upgrade slots (instead of the proposed 6 for the Moth), safe depth of 150, crush depth of 250, be 25% faster than the moth without using more power, have the compass and perimeter defense built in (not using slots), and is about 20% stronger than the Moth. Or have the ability to build a glass elevator that allows you to watch all around you as you ascend/descend. The lift as a component like the ladder to integrate into vertical tubes. Generally glass structures are more beautiful, but for the price of instability. Unless the devs would allow enameled glass tubes, for the price of lots of tooth to hunt for. We need a glass T, a glass dome for the roof and floors of the rooms, the ability to mount the hatch to the 5 spots in the roof and floors of the rooms, the ability to rotate the ladder, the vertical tube to let water flow through them when our base floods (this could be done if they are larger round) a ladder to mount on the outside of our bases (for if the game glitches and we end up walking around on the ocean floor or so if we build above the water we can climb up to a platform from the water), the spotlight your working on for the darker areas, the bioreactor able to be mounted inside instead of outside (this would both give us another thing to put inside our bases and to let us mount it inside the Cyclops so we can power it and recharge it until you get the solar upgrades or a docking system made), the accumulators usable so they don't just store power on there own but instead make it so we can pull out and save the dead power cells so we can put 6 of them into each accumulator to recharge them or to power the base/Cyclops, have some sort of power receiver/generator that will let us recharge the Cyclops, another 4 upgrade slots on the other side of the engine in the Cyclops, alter the Sea Moth so it has 6 upgrade slots so there are 3 on each side and the 4th spot is a button to let us turn off the lights or main power to the Sea Moth (turning off the transmitter as well). I saw this and thought I would share it with the rest of the forum users. The checkin list doesn't let me scroll to the side to see the whole thing on my 5c. How can I see all they have checked in? Posted a discussion on Vehicle Gameplay, lights. Need to be able to toggle lights and speed for vehicles. there is always quality www.ourcase.co.uk work being done, not rush jobs just to meet deadlines, and every patch is a www.casesam.co.uk surprise when it comes out. Personally I'm not sure why this thread was not locked from the start. This should be a thread for Developers to post "Development Updates". Instead it is everything else, resulting in no real reason to look at it. I mean the ideas and comments are great, but there are already places for those, and this thread isn't it. - Could we know what it is ? What is it used for? -And we need to start a game to enjoy these updates ? or the current game is automatically update ? If you do need to start a new game to enjoy any of the updates you'll get a warning to that effect when you go to load a game. From my experience, the little updates do not require a new game, but the larger ones do.